Hey folks! 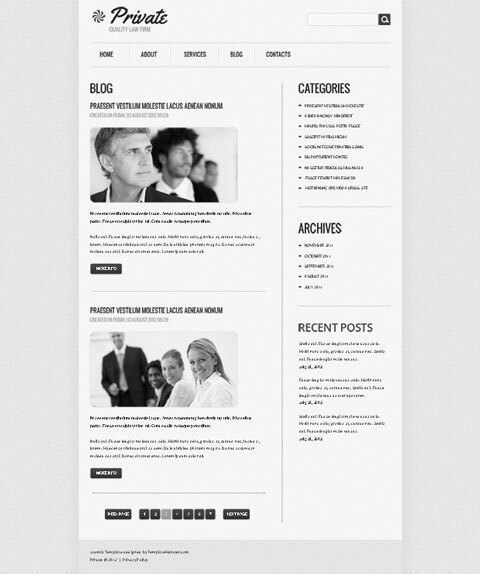 Free Joomla Law Template created by the best designers is waiting for your appreciation! Simple, but attractive this freebie is at your disposal. Nice free website template to start a project realization without any stress and long-lasting search for the needed solution. Restrained colours are just stylish cover for Joomla functionality. Being flexible and modern this template will be the quickest way to get online in the shortest period of time causing no troubles with the process of customization. Just download the whole package of Free Joomla Law Template visiting the download page at TemplateMonster, type your email address (don’t forget to uncheck the newsletter subscription checkbox in case you’re already subscribed, otherwise you may not be able to download the zip file). It is the very time to make true your ideas and start your business! Make the most of this freebie turning it into your prosperity! Fantastic points altogether, you just won a new reader. What may you recommend about your put up that you simply made a few days in the past? Any sure?